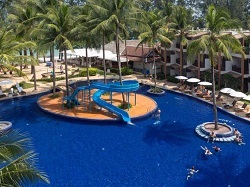 Bang Tao Beach is one of the best locations in Phuket for family vacations, with a fantastic selection of family friendly hotels that are located directly on the beachfront. 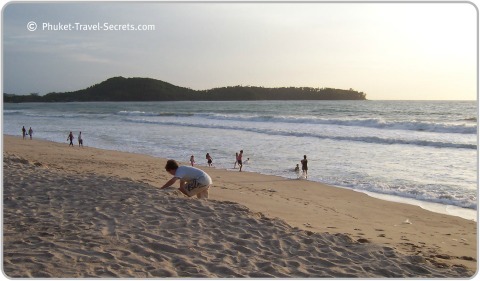 The beach is a large open bay, stretching 8kms in length, and is the second longest in Phuket. Bang Tao is also known as Laguna Beach, the area around here was once used for tin mining, but has been developed into a luxury resort called "The Laguna Phuket Complex". 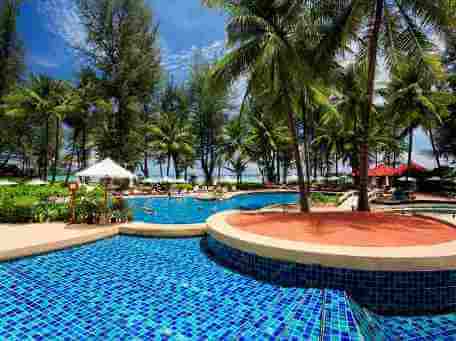 Bang Tao is located between Nai Thon and Pansea beaches on the North West coast of Phuket. 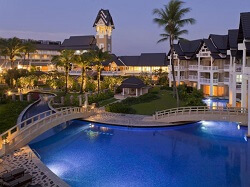 The Laguna complex is home to a collection of upmarket luxury resorts, hotels and villas which are situated around six picturesque lagoons and the 18 hole Laguna Golf Course. Bang Tao beach is just a few minutes away from the town of Cherng Talay where you will find local villagers that still make their living by farming, fishing and rubber tapping. Many expats from around the world choose Bang Tao and the surrounding area to buy their multi million dollar villas. You won't find vendors on the beach renting sunbeds as all the sunbeds along Bang Tao beach are provided by the hotels and resorts and they are exclusively for use of their guests. You will still see the odd vendors that will try to sell their goods along the beach. From November to April Bang Tao beach has a great selection of beach activities including, paragliding, kitesurfing, banana boat rides and jet skis. Guests of the resorts are also able to enjoy windsurfing and Hobi cats. Surfing is pretty good at the northern end of the beach. 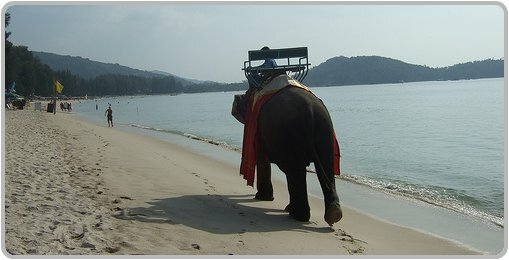 Other fun activities for the kids at Bang Tao beach are horse back riding or elephant rides along the beach. From May to October swimming at Bang Tao beach can be quiet dangerous. Always check to see if there is a red flag, which is generally located on the beach as you exit the Angsana Laguna Resort. If there is a red flag do not go in the water! Most of Bang Tao beach is occupied by the Laguna Resort Complex, which houses some of the best resorts and villas in Phuket. 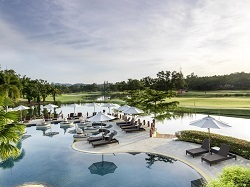 Angsana Laguna Phuket Hotel offers endless recreational facilities with a great choice of accommodation for families, with its own very important kids club. Here you can see baby elephants stroll through the grounds of the resort. Read more on Agoda. 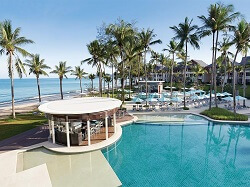 Dusit Thani Laguna Resort is an idyllic retreat with a variety of recreational facilities, including a large swimming pool which overlooking Bang Tao Beach. Laguna Holiday Club features 79 spacious suites that are available in three room types with separate living, dining and kitchen areas. The resort overlooks the beautiful fairways of the Laguna Golf Club. Read more on Agoda. 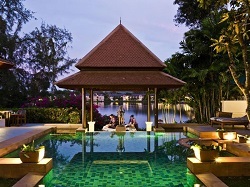 Banyan Tree Resort is the perfect spot for a romantic getaway. Banyan Tree features a range of villas and pool villas which are ideal if you are after privacy, not to mention the spa facilities are definitely first class. Read more on Agoda. Angsana Villas Resort is a collection of two, three and four bedroom villas. With Thai inspired architecture, contemporary tropical interior and modern facilities creates a perfect spot for a private family vacation. Read more on Agoda. 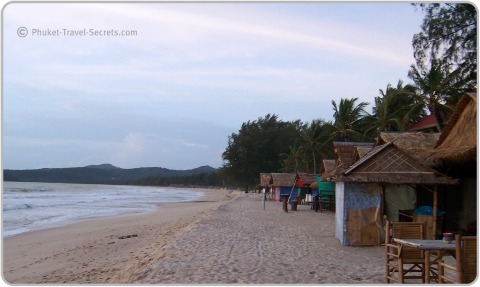 There are many other resorts and hotels available at Bang Tao Beach outside the Laguna resort complex. Or alternatively you may choose to stay in the privacy of a villa or apartment. 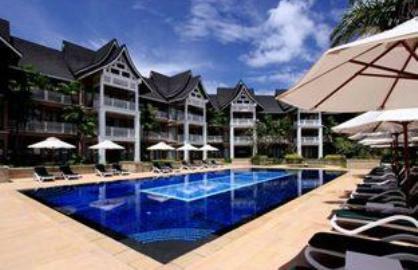 Sunwing Resort & Spa is located on the beach at Bangtao, a popular resort for families. Facilities include family rooms, babysitting, poolside bar, restaurant and WiFi. Recreation facilities include a gym, Jacuzzi, Kids club, spa, pool and kids pool. Read more on Agoda. 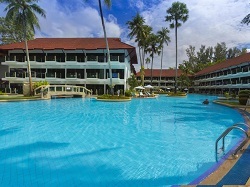 Best Western Beach Resort & Spa is also located on Bangtao Beach, here you can relax and enjoy spacious rooms with private balconies with ocean views or a deluxe bungalow on the beachfront. A great place to stay if you're travelling with the kids with a range of 2 bedroom family rooms. Read more on Agoda. Amora Beach Resort features two large swimming pools with absolute beach frontage. Water activities at the resort are endless, ensuring that everyone is entertained. Read more on Agoda. 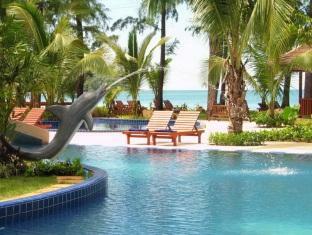 There are many more villas, resorts and hotels located near Bang Tao Beach, priced to suit all budgets. Use the search box below to find your preferred accommodation. Located within the Laguna Phuket Complex , is a beautiful wedding chapel. The chapel offers 360-degree panoramic views overlooking the beautiful seaside lagoon with Bang Tao beach nearby. The Laguna Chapel is the perfect venue for a romantic wedding in Phuket. Within the grounds of the Laguna Resort Complex you will find 30 restaurants and bars, with some of the best fine dining restaurants in Phuket. Located on the road towards the entrance to the Laguna Resort Complex you will find a nice selection of restaurants. DeDos Restaurant, is where you can try new flavor combinations that capture the best of Mediterranean, Thai, Japanese and French Cuisine. Open daily from 6.00pm to 10.30pm. They also provide a free shuttle service for guests staying in the Laguna area. Riverside Restaurant is located between Surin & Bang Tao, offering affordable, tasty local food. Pooh & Friends is another great option, also located at the southern end of Bang Tao Beach. The Bistro is a little more upmarket, it is located only a 2 minute walk from the Best Western Resort. Nightlife around Bang Tao is mainly within the luxury five star resorts, the resorts have their own restaurants, clubs and bars and usually some form of entertainment. The Siam Supper Club is a popular destination for locals and tourists alike, here you can enjoy a drink and listen to jazz music. There is also Pepper's Bar which is also located on Lagoon Road. Here you can enjoy a game of pool or watch some sport on the big screen in the comfort of the air-conditioned bar. Catch Beach Club will be re-opening at Bang Tao Beach in December 2017. The evening market on the main road in the middle of Bang Tao is definitely a place where you can try the local foods and pick up some bargains. There is also markets heading back towards Surin Beach with fresh food and cooked foods, clothing and shoes. We brought a lot of billabong shirts at these markets and the price was cheaper than in Patong. But it was the low season and we did buy lots of shirts, so they may have dropped the price to get the sale. Take a walk along the beach and you will find a few shops, well not shops but shacks that sell beach wear such as dresses, sarongs and sunglasses. You will also find beach vendors, but not as many as in Patong that sell Billabong shorts and shirts. We did buy quiet a few pairs of billabong shorts off one of the beach vendors and they were really good quality. Along the road outside the entrance to the Laguna Resort Complex, you will find a range of shops, that stock household items and furniture. There is an Asian Art and furniture store that has a collection of Asian Art, such as handmade wooden Budda images and elephant statues. You will also find an art gallery and a mini mart which is a lot cheaper than the mini mart within the Laguna Complex. If you go into Bang Tao along the Main Road you will find a 7 Eleven that is cheaper again. Just inside the entrance to the Laguna Phuket is the Canal Village Shopping Centre, that have a range of goods from crafted antiques to designer clothing. You will also find the Bangkok International clinic, a mini mart, laundry and dry cleaners, currency exchange and the village bakery. Bang Tao Beach is about a 40 minute drive north from Patong, and a taxi will cost around 500 baht or 900 baht return trip. Try not to use the taxis that are located through the resort complex as they are expensive. Catch the resort shuttle to the entrance of the complex and then get a taxi from outside the complex, it is cheaper.